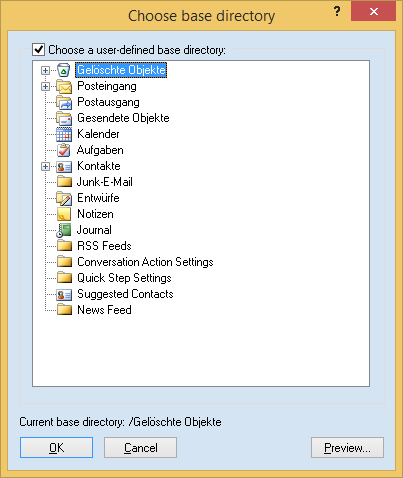 Consequence: Easy2Sync for Outlook can only see objects in or below the base directory. You want to synchronize the folder “Contacts” from your PC with the folder “Contactos” from your Spanish colleague’s notebook. Normally this would not be possible since the folders have different names. To make it possible, first configure the task as usual. Then select the contacts folders from each data storage as base directory. If you now use the “Preview” function, you will see both sides the same, namely just the contacts and no subfolders with different names.